Broad Green’s recent bid to become recognised as a village has unearthed a dark underbelly of conservatism and discord. Changing a local name is one thing, but can a rebrand change the local people as well? Recent news that residents in the Broad Green area are considering renaming the area ‘Broad Green Village‘ has reopened one of the most interesting debates about Croydon – that of how we describe the borough we live in. Croydon’s multiple unsuccessful bids through the years to gain ‘city status’ have always been rabidly contended. As the most populous borough in London, there are many who say to limit Croydon to being merely a town – in the same way that Milton Keynes, Skegness, and Winnersh are towns – is to do it a great disservice. Now, it seems, even suggesting change to the status of Croydon on a much smaller level is equally as contentious. To my mind, villages conjure up images of thatched houses, vicars on bicycles, and libraries that the locals still bother using – all in a rural situe. The sort of thing that UKIP voters find positively pornographic. Indeed, this is what Broad Green once was hundreds of years ago when it started life as simple triangular green that spanned the area between what is now Handcroft Road, London Road, and Sumner Road (for more information on the history of Broad Green, please take time to visit Cathy Aitchison’s wonderful Documenting Broad Green project). With the march of progress and Croydon increasingly becoming a significant site of industry, the verdant plot of Broad Green would eventually succumb to retail and high-density housing in the late 19th century (to learn more about the changes during this period, check out Kake Pugh’s incredible 30 year tour of London Road). Now, Broad Green is a populous and bustling metropolitan area with all the attendant joys: A-road traffic jams, impatient commuter footfall, Lidl, and a caravansary of lurid Afro-Caribbean hair shops and open-front markets. A village it is not. If we can redefine marriage, why not a village too? Appropriating the word ‘village’ as a catalyst for economic and cultural regeneration is not new. Brixton Village – a covered market with no cricket green or warm lemonade in sight – has benefitted greatly from adopting the name for its distinct market area, leading to significant improvements to the public realm (if you’re subscribed to Local Government Chronicle, see this article article to learn more). West Croydon’s quest for redefinition as a village is a bold move that has the potential to challenge everything from local house valuations to national press coverage. More profoundly, there are psycho-geographical questions about whether a name change would force Broad Green to return to its more traditionally village-y traits, or will it cause us to revisit how we define ‘village’? Most of the time these things are nothing but a brief flash-in-the-pan; fodder for ailing local papers. 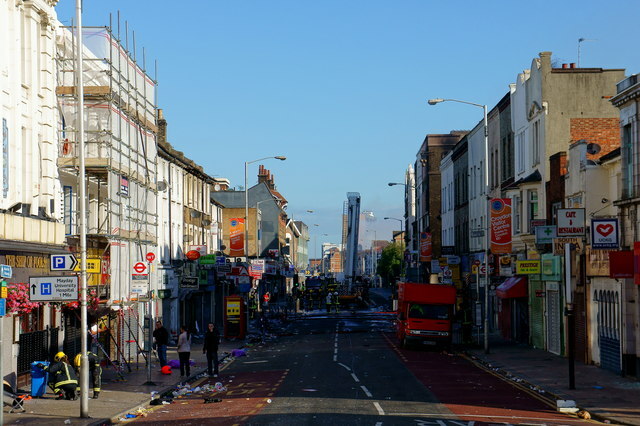 But I admire the pluck – Bushra Ahmed is a force to be reckoned with and it is bolshie moves like this that spur action in a borough that moves at a sluggish pace when it comes to regeneration. Perhaps more interesting than any particularly localised rebrand is the type of people it has drawn out of the woodwork. In particular, the peculiar band of refuseniks who react with anything from gentle pedantry to unbridled rage every time the idea of Croydon changing its identity is suggested. There is something about change – particularly changes to our environment (however conceptual) that seems to move us to our very core. When it comes to the area we call home, we are all conservatives. The first time I noticed this phenomenon was during Gavin Barwell’s regeneration talk in July 2011. Susan Oliver – with her sanguine transatlantic ways – made the mistake of referring to Croydon as a city (full disclaimer: she was bigging up Croydon Tech City). The reaction from the audience was quite extraordinary: the formerly sedate octogenarians - who had sat through ninety minutes of being told their futures were contingent upon a giant shopping mall – clamoured ferociously, “Croydon is NOT a city”. The Broad Green Village debate looks to be a repeat performance of what happened in the town hall that night, except this time by all ages. The Bygone Croydon Facebook page in particular is an open sewer of opinions on the matter – with views ranging from the xenophobic to the jovially defeatist to the lumpenly poetic to the tenderly passive-aggressive. It is increasingly apparent that if Broad Green fails to become a village, it will not want for applicants to be the idiot. What is much more interesting is the type of Croydonian that this debate has exposed. For the most part, they seem to be masochistically resistant to change, ideologically inert, and possessing a perishing lack of imagination. You can change a name, but you can’t change people – that is the West Croydon Community Forum’s bigger challenge. However, the point that critics insist on missing is that no one at the West Croydon Community Forum is saying that a rebranded Broad Green is the sum total of regeneration for the area. Rather it is to be a distinct and decisive opening salvo signalling that far from being down-and-out, West Croydon is going to come back from its riot-torn past with a vengeance. I, for one, hope they succeed. Still not convinced about the merits of another Croydon village…? Then check out Croydon Tech City TONIGHT! The next Croydon Tech City event is tonight at 7:30pm. If you are still undecided, don’t be, and sign up here. I lived at 18 Hathaway Road from 1935 to circa 1950. Loved it, despite the bombs and austerity then. A meal in the Civic restaurant (next to the Savoy cinema) was wonderful, and cheap. Nice coloured pictures on the dinner plates to encourage kids to eat all the food, (though most of us needed no encouragement then). Going to school (Elmwood, Mr. Thatcher the headmaster) and playing in the crater left by a bomb in the front playing field. Learning to dance in the Lonsdale Dance Studio, above what was the Civic restaurant. All these cherished memories live on. But now? Broad Green as a village? Do me a favour, please! It’s just NOT a village. Many other names might be nearer the mark: discuss! If a green is an area of undeveloped land, and a village is at least a settlement of human dwellings, Broad Green is more like a village than it is like a green. Someone once said “London is a collection of villages”, so why not Broad Green? We already have places in London which call themselves villages, such as Brixton Village as mentioned and Dulwich Village. Broad Green Village would make a worthy addition. One problem Broad Green has is that I suspect most people don’t call the area by that name. They would say “London Road” or “West Croydon”. So perhaps part of the campaign should be to spread recognition of the name. Oh sound the trumpet, bang the drum for Mary Portas and the the restaurant quarter too. But Croydon North should mind our place, catcalls and boos for us will have to do… ’twas ever thus! aye ’twas ever thus. From this article you’d think anyone who doesn’t view Broad Green as a village is a racist, inert, reactionary Luddite. South Croydon attracts lots of people because of the restaurants there, not because the council put up signs calling it the restaurant quarter. You seem to want to call Croydon a city and part of its inner area a village. Fair enough. But people who prefer not to engage in constant rebranding exercises deserve a fairer portrayal than the one you have afforded them in this article. Your denigration of those with another opinion, comes across as somewhat unfair.